Introduce with study programs catalogue and choose a study program you would like to apply. See a study programs catalogue here. Study fee for non EU citizens here. Study fee for EU and Switzerland citizens here. Four passport size photos (3x4 cm). 4.1. Register on our website: www.rta.lv/en/register/ by filling our registration form and following the further instructions for activating your account. Also you can use your existing google account for quick register. 4.2. Login into your account on our website http://www.rta.lv/en/login using your account credentials or existing google account. 4.4. Choose desired study programme level and start new application procedure. More information about application form and file upload can be found on our application procedures manual. 5. Rezekne Academy of Technologies receives electronically application form and documents copies. Certified copies of the Applicant’s diplomas are delivered to Academic Information Centre (AIC) for recognition (www.aic.lv). This process could take from 3 weeks to 4 months. After checking received application form and documents copy’s Rezekne Academy of Technologies will send Conditional Letter to Applicant. prepares Invoice were Application fee (100 EURnon-refundable), study fee for first year of studies, Temporary Residence Permit fee, dormitory fee for two month and safety deposit 500 EUR included. The prepared Invoice electronically sent to the Applicant. Transfers payment of Invoice to RTA bank account indicated not later than 25August or 2January. 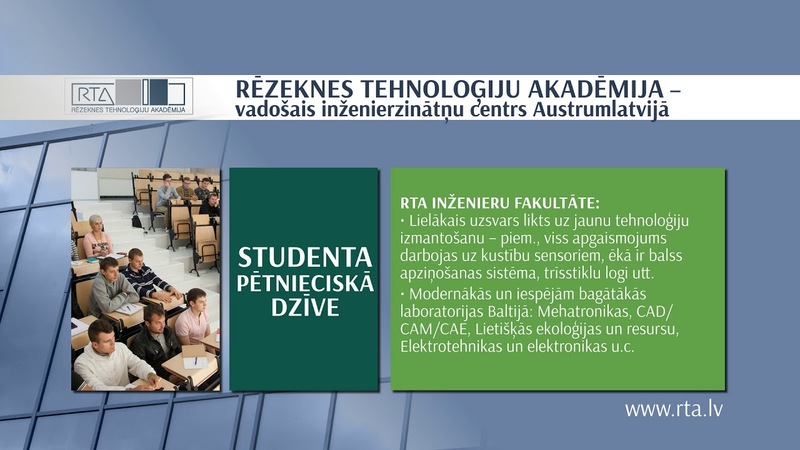 Candidate’s Name/Surname, application fee for studies at Rezekne Academy of Technologies –study programme “____________”, full time studies. Bank reference about transfer of payment. The application package should be received in RTA not later than 25 August (applying for the autumn semester) or 10 October (applying for the spring semester). Documents are reviewed and RTA send Admission Letter to Applicant. Please note! Application documents without all required annexes and payment confirmation will be understood as non-valid and will not be forwarded for further processing.